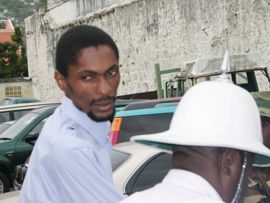 These were the words being uttered by convicted murderer Selwyn âKashieâ Foye as he was being led away by Police Officers at the High Court on Wednesday. Foye will however have to wait until December 19 to know his sentence. The three-week old trial heard evidence from several witnesses including shop owner of Carierre, John Thomas. Thomas said that a âcookoutâ was taking place at the junction earlier; he said he saw the defendant at about 5 pm sitting on a wall close to the shop. Thomas recalled Browne leaving the shop around 9 pm. He said after seeing him in the street on his stomach, he and two others carried him to the Levi Latham Health Center. Wife of the deceased Florence Browne said she was sitting on her porch at about 7 pm when she saw a van pass down the road and a tall man ran behind the van and into the grass. âI did not see the van come back and I started getting a bit scared when I saw the man go in the grass so I went back inside,â said Browne. She recounted hearing two shots fired. Son, Lenard Dabreo, said that he was at the shop of Leonni Guy that night where a domino match was being played. He said he received a call from his sister and went to the Levi Latham Health Center where his dad was. He recalled seeing his father with wounds to his abdomen and crying for pain. Dabreo told the Court that it was not until he reached the Milton Cato Memorial Hospital that he asked his father who shot him. Under cross examination by Defense Attorney Kay Bacchus-Browne, she asked him why didnât he ask his father who shot him while they were at the Health Centre and while in the ambulance. Dabreo said that he had decided to ask him when he arrived at the Hospital. Leonni Guy told the Court that she saw the accused at her shop that night and the captain of one of the domino teams told âKashieâ to play but he declined. When Foye took the stand he said that he was at the shop around 9 pm and was in the back room looking at a domino match. He said he never left the shop between the hours of 1 and 2 am. Foye also told the Court that he never heard that Percy Browne got shot but instead heard that someone was shot. The accused man said that he never had any dispute with the deceased and he only saw him earlier in the day at about 5 pm at John Thomasâ shop.